Samuel Taylor and his second wife, Susan Van Houten, lived southwest of Table Rock. The information about them and the other Taylors can be sketchy and confusing. Take all secondary information as suggestion and verify. The county records from this era consist of entries in a log book. The log for this marriage identifies George Griffing as the minister; Griffing was with the Table Rock Methodist Church. It was the 37th marriage in Pawnee County. The witnesses were Samuel and Susan Taylor. Samuel was his father. Susan was his stepmother -- the mother of Emrah (or Emer) was Samuel's first wife, Sarah, who according to one researcher died in Iowa in 1853. 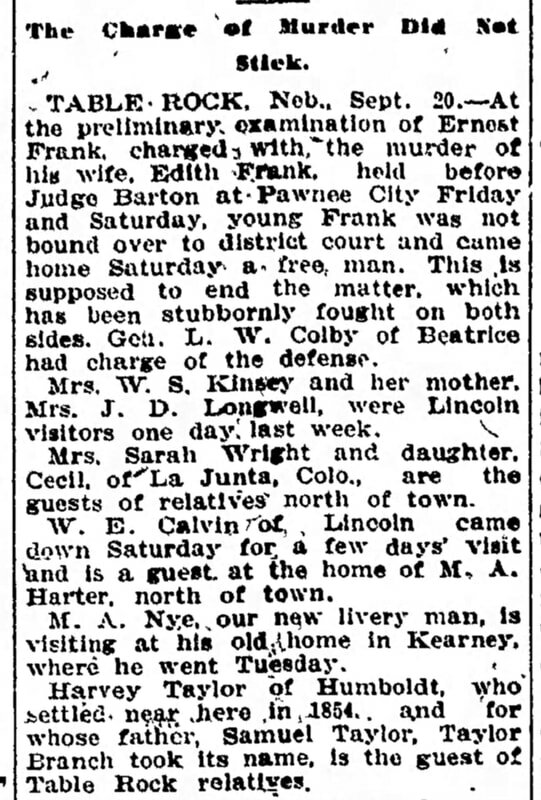 At the end of several social items headed under the most interesting, relating to the murder of newly-married Edith Frank, is an article full of information: Harvey Taylor lived in nearby Humboldt. Presumably giving information provided by Harvey, the paper reported that Harvey's father was Samuel Taylor, that Harvey settled near Table Rock in 1854, and that Taylor Branch was named after Samuel Taylor. This is the information provided. It seems to be a good compilation, although it lists Zirilda as a daughter rather than a daughter-in-law (wife of son Emer). Be careful to keep Robert Butler Taylor, Samuel's son, separate from the Robert Taylor who came with brother John.